Create A Last Minute Holiday Gift! If you’re still searching for Holiday presents and don’t want to deal with the crunch at the Malls – here is a gift idea you can create at home with your family. Put on some favorite music and it’s time to create a gift that captures the essence of the holiday spirit! -First decide who are you making a Coupon for? For the holidays, my daughter and I decided to make a Coupon for Mom! -What Should the Coupon be for? Here’s the fun part – the coupon can be redeemable for something special you will do for the recipient. The coupon can be for anything! 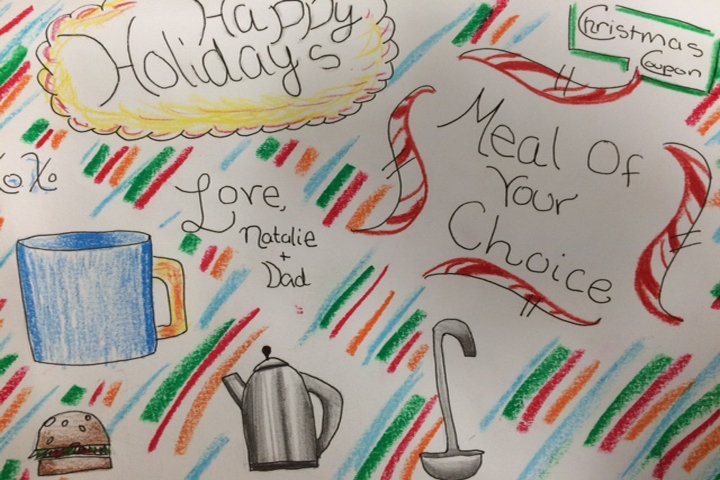 Natalie and I brainstormed about some things we could do for Mom that she’d enjoy – that might make her life a little easier – more joyful and best of all – something that she wouldn’t expect: cook a special meal for her, do the laundry for a week, or take over all dog-walking for a month. For a Hard Copy Coupon – Spread out whatever types of paper you have around along with crayons, pictures, crayolas, paints, , craft materials (small feathers etc). And of course all these media can overlap! Create a digital image or use a digital photograph of someone – and incorporate that right onto your hard copy card. This is the best part: design a coupon that captures the essence of what you are offering to do for someone. Since Natalie and I decided to (try and) make a meal for Mom – we created the whimsical coupon at the top of this post. The possibilities are endless & the Coupons Have No Expiration Date! –Another option is to pick a charity that is meaningful to someone. -Honor someone’s memory by creating a card with donation to help find a cure for Alzheimers, ALS, Cancer or another cause. I had great success with the free Google cardboard headsets (Verizon stores were giving them away free for a limited time – check your local store if some are still available). I had no problem aligning my iPhone with the double screens – and the virtual images I saw were crisp, focused and stunning! For the fun of it, I purchased a Matel View-Master (plastic headset model) for $27 – it is compatible with all Google Cardboard Apps. The manufacturer promises you will “Experience the 3D world in a Whole New Way with our latest View-Master.” I was extremely disappointed with the product. The headset, despite a pretty cool looking design, felt clunky when I looked through it and there were issues aligning my iPhone on the mount inside the viewer. Images were not consistently clear. One thing I did enjoy was playing some of the free games (especially the traveling in space one) and using a virtual indicator to make choices during my space launch and travels. Not worth $27 though – and I returned the View-Master to the manufacturer. There are some higher price options available such as the Zeiss ZR ($129.00) – but for now I’d stick with the free Google cardboard headsets. 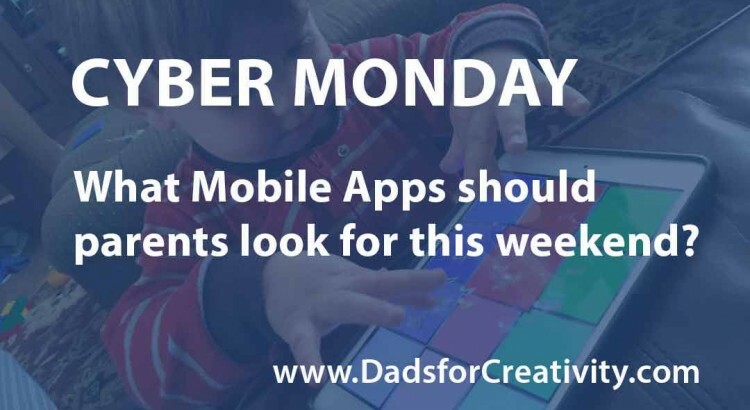 CYBER MONDAY: What Mobile Apps should parents look out for this weekend? Usually Saturday’s is devoted to a 3 Question Interview, where we get to hear ideas from subject matter experts on Creativity or creative activities. However, this Monday is CYBER MONDAY, which means there’s an opportunity for us to grab some new mobile apps at discounted prices. Sadly, it’s impossible to know what apps will go on sale come Monday, but I’m going to share some of my more recent favorites, as well as three from a previous 3 Question Interview with award winning educator Jonathan Nalder. Now as I’ve referenced in the past, most toddlers will begin to develop an interest in mobile devices by observing their parents with the technology, but there are some specific apps that offer the type of interactivity that can enhance the experience for our young ones. This CYBER MONDAY look out for apps produced by WonderKid, and as of today Tiny Farm – Animals, Tractors, and Adventures, is currently available for FREE. Other Toddler apps to look out for are Baby Musical Hands and Toddler Cars. For preschool, the selection expands considerably and parents should identify apps that fit their child’s interest and creativity. My new favorite, The Earth by Tinybop is right now discounted at 75% off, and another preschooler app to checkout this weekend is LaunchPad. 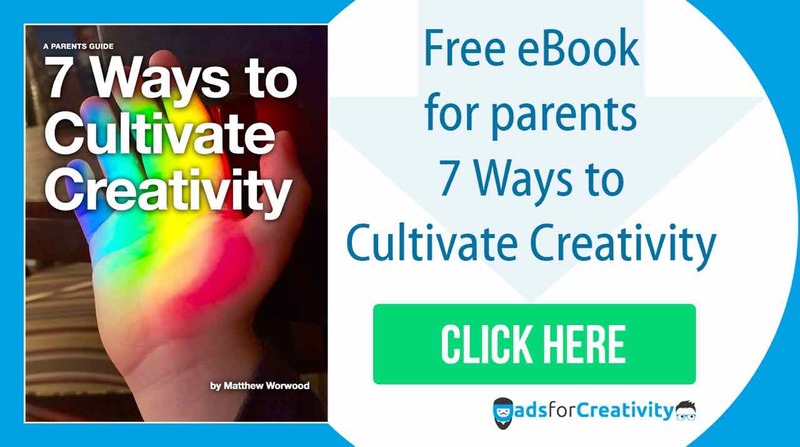 Here are 3 others suggested by award winning educator Jonathan Nalder as part of a DadsforCreativity 3 Question Interview on Mobile Apps for Childhood Creativity. We’ve received requests on what mobile apps are best for young children? What are your three mobile apps for creativity at home or in the classroom? Minecraft – is far and away one of the most popular apps for 4-10 year olds – because it lets them use their imagination and challenges them to constantly problem solve. Only caution is to manage access to the ‘survival mode’ for younger children as it introduces gameplay elements such as dying, zombies and other such elements. MyPlayhome – is now a series of apps that allow kids to act out home, shopping and school/ kindy environments. 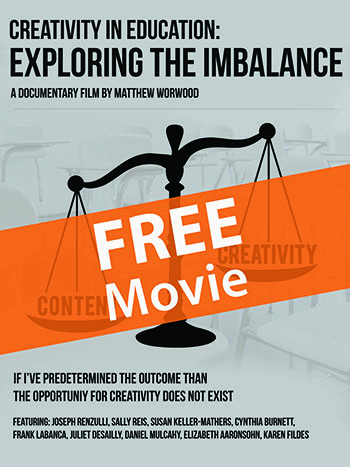 A great one for them to experiment with different situations and to explore the interactive rooms on offer. PuppetPals – a super simple app for creating animated videos that records a child’s voice and on-screen movements of puppet characters (which can include their own face) to introduce them to digital storytelling. I’ve been extremely busy at work this summer, with one project involving the delivery of some rather expensive items, which came with reasonably big boxes. There were so many of them scattered around the room it seemed unethical to throw them out – though we did, apart from one, which made it home to my little boy. I had originally planned to produce an unboxing video for YouTube, but sadly my wishes have taken a backseat to eldest’s ‘needs’ and in just over seven days, my box has served as a magicians table, frozen palace, volcano, part of a continent, and as you would expect, a house. It has literally become his favorite toy, and I doubt Mommy will be able to throw it out anytime soon. In fact, only today I was asked if I have anymore to bring home, so if anything we might be adding to the collection, and perhaps I still might be able to produce my unboxing video. 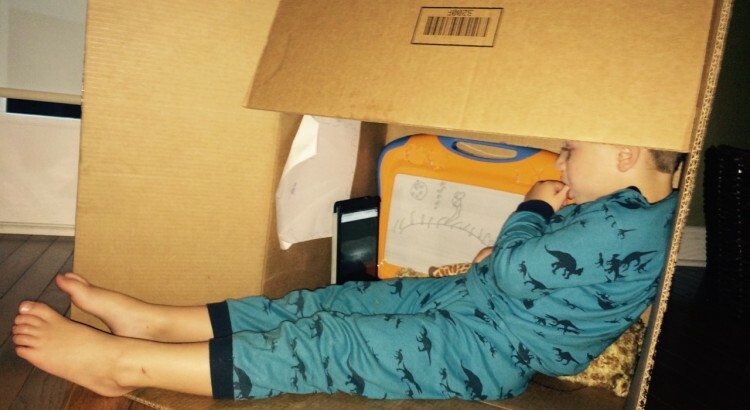 I’ve shared some pictures that clearly support the saying that kids love boxes (and all the fun games with boxes), and it’s been great to see or the characters and costumes that have manifested over the past week. Even little brother has got involved, though bog brother was not happy with his new squatter who would quickly occupy his home whenever he vacated for a few minutes. A window was one of the first things to be added to the box. 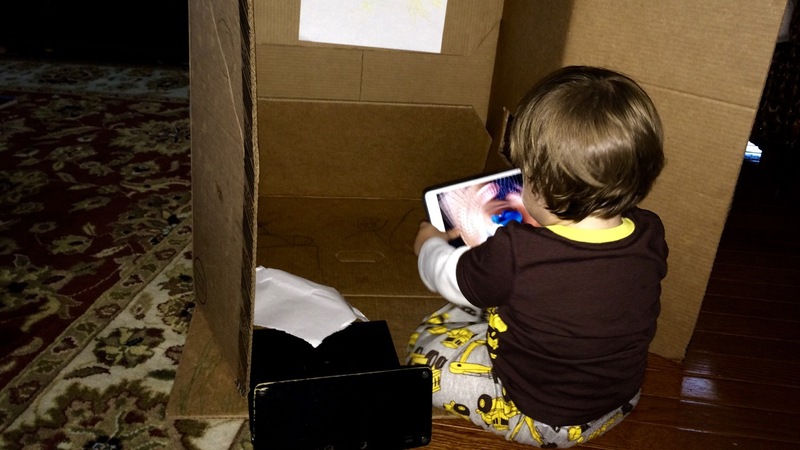 Here is an example when little brother took advantage of the vacant box and iPad that has been used as the TV. Such a fun, and extremely simple way to challenge your little one to produce and consider as many alternatives as possible – how many ways can we play with a box? 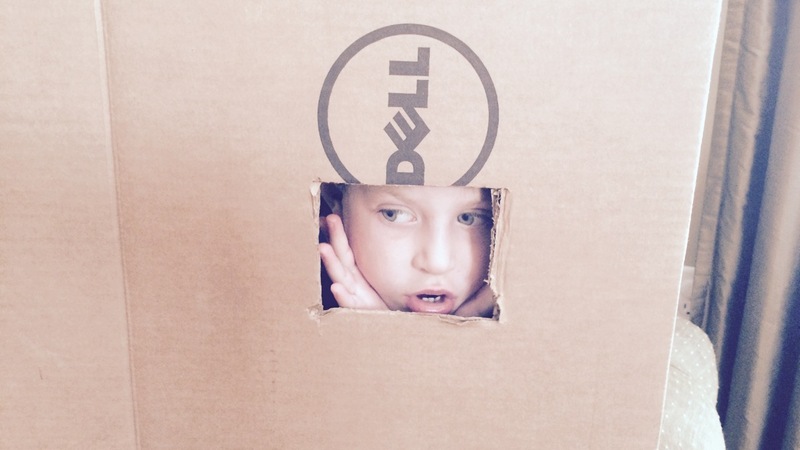 So next time a big deliver comes your way, keep the box, throw it in the middle of the room, and grab your camera – because fun, play, and creative thinking will quickly follow. If you liked this article you might want to check out It Doesn’t Go Here. Ok, I’ve been thinking about Fathers Day, and what us Dads want other than the new Apple Watch. Below are some last minute big boy toy ideas that might reengage our childhood play and/or creativity. If you’ve already got something – fear not – these can be additional Father’s Day gifts from the kids. I’ve added $ signs to indicate their price and all are available from Amazon. Those with one symbol are $50 or below, those with three symbols are over a $100. Please, please, please feel free to post some additional ideas, I will post this article again next year and can include these suggestions. 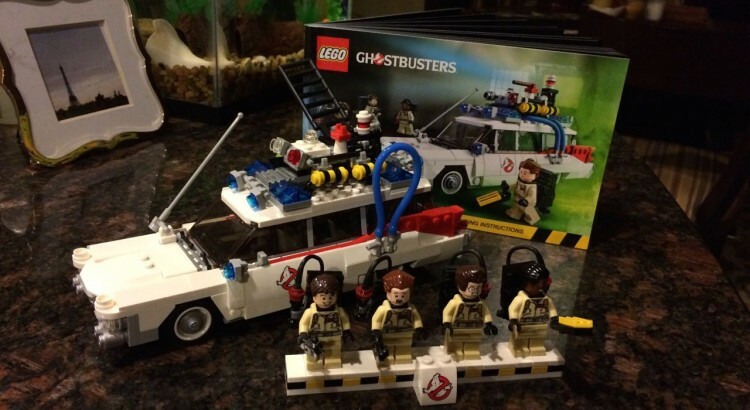 Lego ($): I would say Lego is a safe bet for most Dads, but if you’re looking for the right box set, play it safe and buy one of the movie classics like Back to the Future, Ghostbusters, Star Wars (make sure it’s from the original films), Lord of the Rings, or Indiana Jones. If you’re looking for something a little more sophisticated look into the Lego Creator or Lego Architecture collection. Google Cardboard ($): Today my wife said asked me what I purchased on Amazon yesterday for $23, I said Google Cardboard, she said ‘what’s that’. I said don’t worry about it! Google Cardboard is just cool, especially for it’s price. At the moment there’s not an immediate application in the home environment, but it might be of interest for the Gamer and will certainly spark the curiosity of any technology enthusiast. Arduino Starter Kit ($): There’s a lot to write about the Maker Movement, but these mini/build your own computer sets are growing in popularity and make for a great gift for any dad who’s interested in electronics or computer science. It’s also highly likely that this toy will soon expand into weekend activities with the little ones that might one day lead into a creative outcome that expands outside the home. Remote Control Helicopter ($): About five years ago my sister in-law purchased a remote control helicopter as a Christmas present. This was one of the best gifts I’ve received as an adult, and I’ve already upgraded it twice. Be sure to get a single propeller with flashing lights. These ones are challenging to fly, but not overly complicated. It’s also something the kids can learn to fly with some guidance. Mind you the Hot Wheels Flying Car is pretty cool as well. GoPro Camera ($$$): We don’t need to over think this one – or cameras in general. This are artistic gifts that have the power to get the creative juices flowing, especially if it’s accompanied with a video tutorial subscription or book. I would also say that this is another useful item to add to the household. Telescope ($$): How often do we look up at the Stars? I think a telescope would be a great way to reengage our childhood curiosity and generate new knowledge in an area that is probably unrelated to our work – this is a good thing, especially when it will likely include the kids and/or a bottle of red wine/romantic evening. Yes, I will be forwarding this article to my wife, who will likely say it’s my Christmas, Birthday, and Father’s Day list combined.